50 | November - December 2015 | www.machinerylubrication.com he purpose of a lubricant is to reduce the amount of friction between two surfaces. In some cases, the base oil in the oil or grease may not have enough lubricity to perform this function sufficiently. The component metallurgy may also require special chemistry. For example, with worm gears, traditional extreme-pressure or anti- wear additives often are too chemically aggressive for the softer yellow metals. 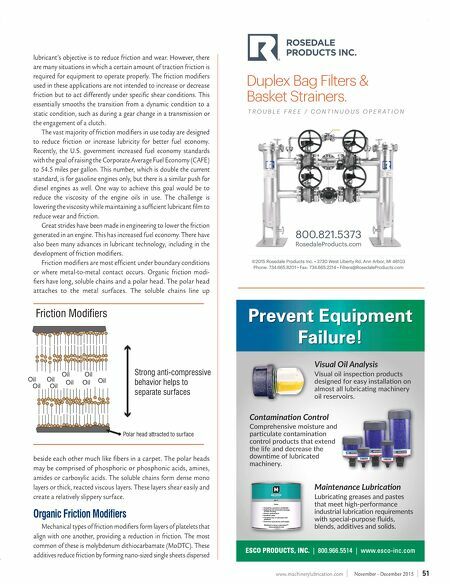 In this situation, friction modifiers are added to increase the oil's lubricity. Conversely, in an automatic transmis- sion, one fluid is used to provide lubrication, hydraulic power transfer and many other functions. The clutches and friction bands within the transmission need friction to function properly. In this instance, friction modifiers are required to smooth the tran- sition from one speed to another. Otherwise, the clutches and bands would "chatter," causing damage and an irritating condition for the driver. A number of compounds are used to modify a lubricant's coefficient of friction. These are known collectively as friction modifiers. They are designed to change the amount of energy needed to cause two surfaces to move past one another. The different types of friction modifiers are shown in the table above. The purpose of a friction modifier varies based on the application. In a combustion engine, the goal is to lower the amount of friction, thereby gaining fuel economy. In clutches, automatic transmissions and industrial applications, the aim is not simply to control friction in order to maximize effi- ciency but to reduce slippage. To a degree, this seems a bit counterintuitive, since a WHEN AND HOW TO USE FRICTION MODIFIERS T BACK PAGE BASICS M o t o r O i l s L oren green | Nori a Corpor at ioN ORGANIC FRICTION MODIFIERS Mode of Action Friction Modifier Products Formation of reacted layers Saturated fatty acids, phosphoric and thiophosphoric acids, sulfur-containing fatty acids Formation of adsorbed layers Long-chain carboxylic acids, esters, ethers, amines, amides, imides Formation of polymers Partial complex esters, methacrylates, unsaturated fatty acids, sulfurized olefins Mechanical types Organic polymers OTHER FRICTION MODIFIERS Type of Friction Modifier Products Metallo-organic compounds Molybdenum and copper compounds Mechanical types Molybdenum disulfide, graphite, PTFE As fuel economy standards become more stringent, more will be required of engine oils. 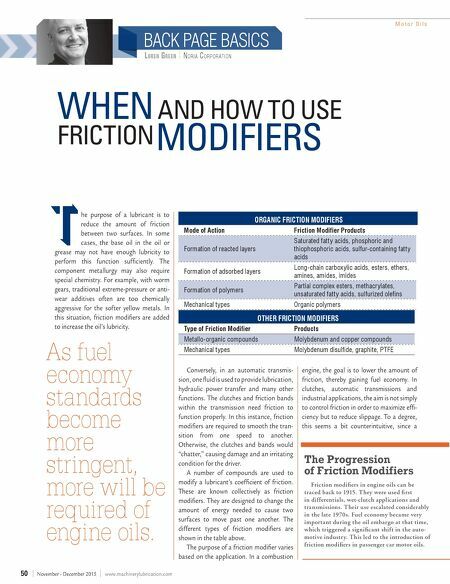 The Progression of Friction Modifiers Friction modifiers in engine oils can be traced back to 1915. They were used first in differentials, wet-clutch applications and transmissions. Their use escalated considerably in the late 1970s. Fuel economy became very important during the oil embargo at that time, which triggered a significant shift in the auto- motive industry. This led to the introduction of friction modifiers in passenger car motor oils.